Interestingly, in the book’s other story, Barry’s dilemma plays a central role in an even more psychologically telling way. Barry is working on a truth serum in the lab and tries it on himself. As he’s walking home, he encounters a robbery. In the midst of of capturing the crooks as the Flash, he feels compelled to rush of and tell Iris that he’s the Flash. Iris turns out to be on deadline and, when she puts him off, the moment passes. When this same thing happens a second time, Barry realizes that it’s the truth serum causing the problem and he gives himself the antidote. Obviously his guilt over not telling Iris about his alter ego is playing havoc in his inner world, but the story nevertheless ends with: “I still haven’t told her I’m the Flash! *sigh* I suppose one of these days she’ll have to know. I won’t be able to keep my secret forever… or will I?” It appears that Barry’s decision was not only haunting him, but writers Broome and Fox as well. This little stall also gives the readers more time to weigh-in on things. Speaking of readers, as if more evidence was needed that the Flash and Julie inspired and spawned a plethora of future comics talent, the Flash-Grams letters page features letters from two future pros: Marvin (Marv) Wolfman and Stephan (Steve) Leialoha. 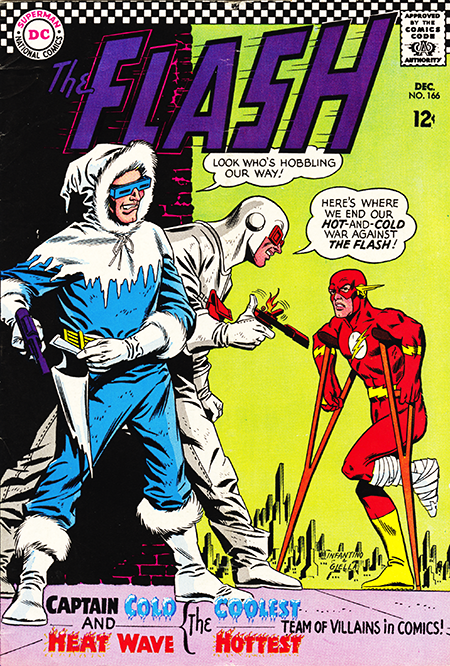 Even as it was beginning to be eclipsed by Marvel, the Flash was still ground zero for future comics pros.